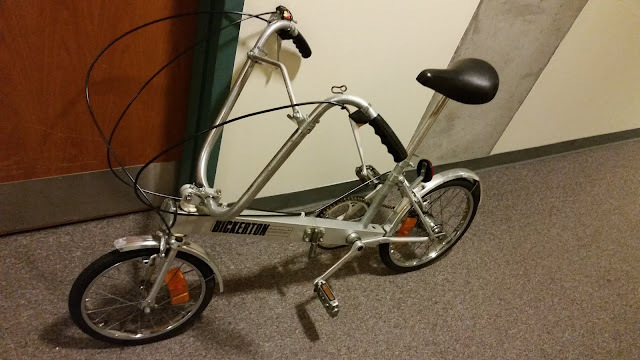 I have been slightly obsessed with the idea of a folding bike for quite some time now. I imagined that with such an apparatus I could store it in my trunk and deploy it for use between the parking lot and my office building (roughly one mile). I could avoid waiting for the unpredictable shuttle buses, as well as the sardine effect when the buses are full. Plus, it would allow for a little bit of exercise, something I don't get a lot of these days. I recently saw a listing online and after a great deal of waffling I messaged the seller. Shortly thereafter my son and I drove to a pretty little village on a lake and I took possession of the bike. Now I am not BIKE PEOPLE. I haven't ridden a bike in years. I doubt I've ever ridden a bike on a highly trafficked urban road. To say that I was nervous the first day is a major understatement. More like nauseous and shaking. I was terrified thinking about BUSES passing me and having to navigate a left turn. But now that I've been riding for a week, it turns out those things are not actually that scary. SCARY is when person after person ambles out in front of me as if I have complete control over the machine I am on. I do NOT! I feel like I need a "Student Biker" sign. Riding on the road with cars is much less stressful than navigating crowds of oblivious people. I also discovered a HILL that I was previously unaware of. Each morning my non-existent leg muscles scream as I crawl towards the top of the hill. Other bikers fly past me. I try to avoid eye contact with everyone. I wonder how long I have to ride before this bit gets easier. Also, I guess I should probably invest in a bike helmet. My odd little bike waiting to be stashed in a closet at work.